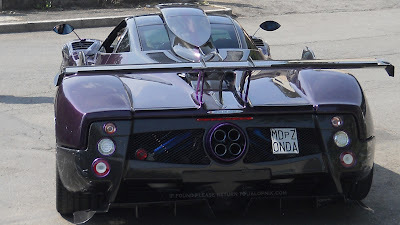 People have talked alot about the upcoming, special one-off Zonda 760LH ordered by F1 driver Lewis Hamilton, and finally someone has snapped some quick shoots while the car was inside the Pagani factory. He has placed his order to the most powerful street-legal Zonda ever made, asking for it to be purple with many components with the naked carbon such as the roof, airscoop, the spoiler, side skirt and other elements. Most of the Pagani's of today comes with a flappy paddles gearbox, but this one will comes with a 6-speed gearbox. And I have to say, it looks quite similar to the one-off Zonda 750 that was ordered by Al-Thani, but then never produced.